The North West Province is the playground of Gauteng, an outdoor adventure waiting to happen. 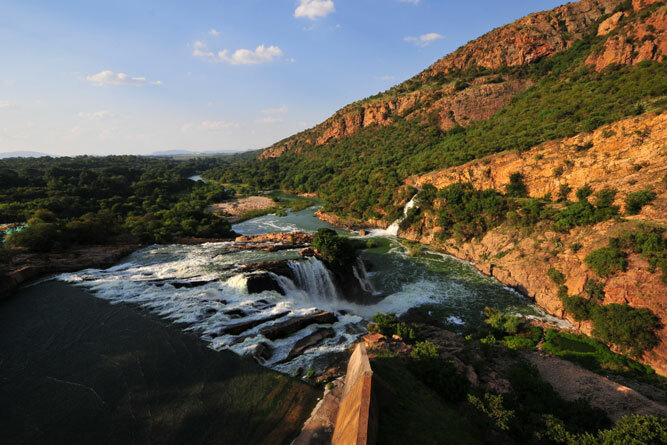 So close to Gauteng it is virtually on its doorstep, it is regarded as outdoors country with a climate to match, and often described in terms of its flatness, smattering of trees and grasslands – it’s the natural habitat of the black and white rhino. But the stars of the province are undoubtedly the Magaliesberg region and the Pilanesberg Game Reserve, which boasts lion, leopard, black and white rhino, elephant and buffalo. And there are also dams, rivers, cliff faces and plenty of sunshine just awaiting discovery. Hartbeespoort Dam alone is one of the major reasons Gautengers leave their province every weekend to while away time on its shores in a myriad of water sports, or head off for the weekend to the Madikwe Game Reserve for a taste of the Limpopo closer to home, without the fear of malaria. Bordered by Botswana to the north, the North West is brimming with outdoor activities that include hiking trails, mountain biking trails, white water rafting, abseiling, fishing and any other type of ‘to do’ you can think of under the sun. Whilst this doesn’t call for much overt exersion, a breathtaking ascent and float over the beautiful Magaliesberg nonetheless does get the blood pumping, particularly if you’re on the flight at sunrise followed by champagne and a full English breakfast. The North West in particular has some of the most perfect climatic conditions for the flight, as wind is one of the major reasons flights are cancelled, and why the Cape is not really the place for hot air balloons! But it is the inspiring aerial views and the incredible sensation of floating that make this such a winner! 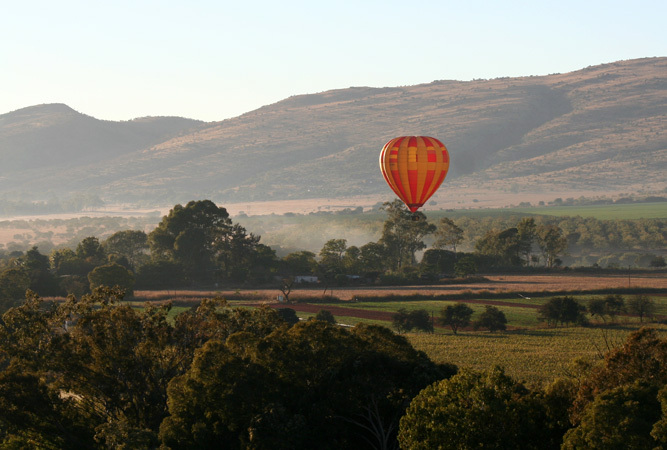 Contact: Click here to view Hot Air Ballooning in the North West Province for various operators. This will get the blood pumping. Swing from tree to tree, or rather from platform to platform, in amongs the cliffs and rock faces of the Ysterhout Kloof in the Magaliesberg just behind the Sparkling Waters Hotel. Eleven platforms have been rigged against the cliffs and joined by long steel cables, along which you get to zigzag – something like a ‘foefie’ slide. The thrill is unbeatable, and the environment particularly beautiful. Contact: Magaliesberg Canopy Tour on +27 (0)14 535-0150. Seated high on the back of the ‘king of the beasts’ whilst exploring the Pilanesberg is one of the most exciting and original ways to see the game reserve. Most of these beautiful beasts are orphans saved from the fate of life in zoos or circuses around the world. It’s a magic experience at sunrise, mid-morning or sunset, or hey, if you want to you can walk with the entire herd on your own, budget providing! Contact: +27 (0)83 382-5905 or +27 (0)14 552-5020. 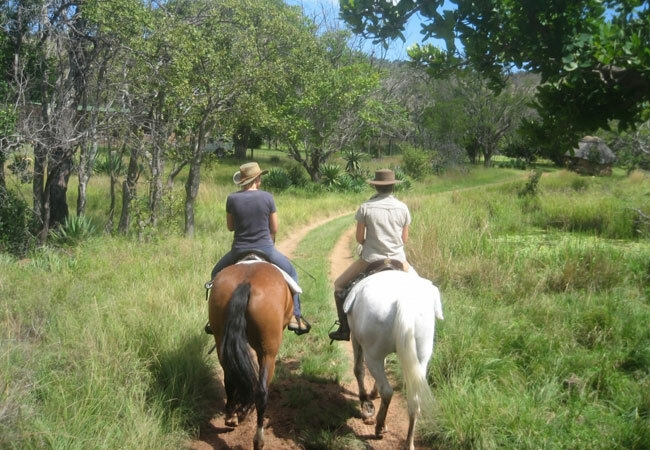 Not all of Sun City is manicured and built up, a great deal of it is dense, rugged bushveld and for this reason meadering through its indigenous forests on horse back is a wonderful way to see small game and experience the bush first hand. Riding on horse back through the African landscape is seriously getting back to nature. Contact: Gametrackers BOP on +27 (0)14 552-5020. One of the better known sites close to Johannesburg from which to paraglide or hanglide, is Hartbeespoort Dam. The site is easy to get to – there is a cableway, so getting up the 350 metre high ridge is not difficult – and the views from here across the dam are fantastic. North West is paragliding heaven, even if it is considered an ‘extreme’ sport – but for those who experience anxiety or vertigo, one can always opt for a tandem flight the first time around, just to get a feel for it. This part of the world, particularly in summer, has huge thermals and cross-country flights are very popular, provided you remain within the ceiling of 720 metres above take-off as this is the controlled air space of Oliver Thambo. Do the unexpected and go scuba diving with indigenous freshwater fish at the foot of the Magaliesberg Mountains. One of the least anticipated action activities for the North West, nonetheless you can swim just below these beautiful mountains whilst taking part in recreational diving. It’s fun for the whole family and caters for both inexperienced and experienced divers. Contact: Miracle Waters Scuba Resort on +27 (0)12 252-2142. To book your accommodation in the North browse the options at Accommodation in North West Province. Save money by dealing direct with accommodation providers – no service fees, no commission. For more adventure activities visit our section on Things to Do in the North West Province. 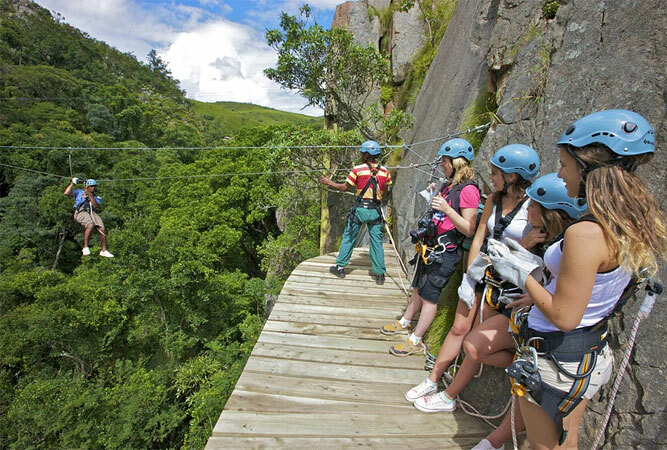 There is plenty to do that will get the adrenaline pumping including kloofing, mountaineering, scenic flights … and lots more.